A4 Size 7.3 x 10.1 in. (186 x 257 mm) 8.3 x 11.7 in. A4 (Mounted) 7.3 x 10.1 in. (186 x 257 mm) 11 x 14 in. A3 Size 10.7 x 14.8 in. (272 x 375 mm) 11.7 x 16.5 in. MEDIUM 15.2 x 21 in. (387 x 533 mm) 18 x 24 in. Tripura Sundari, the ‘Beautiful or Charming Lady (Skt. sundari) of the Three Cities (Skt. tripura)’, manifests as the third of the ten Mahavidya or ‘Great Knowledge’ goddesses of the Hindu shakta-tantra traditions. Among her thousand epithets she is also known as Sodashi (sixteen year-old), Lalita (playful), and Kameshvari (goddess of desire). She is also widely known as Shri or Shri Vidya (glorious knowledge), who is worshipped by way of her well-known Shri Yantra or Shri Chakra ‘device’ or diagram, with its complex geometric structure of nine intersecting red and white triangles that create a configuration of forty-two smaller triangles. The term Tripura relates to a Puranic legend where the great gods or devas, led by Shiva, ultimately destroy the three fortress cities of the demons or asuras. Built respectively from gold, silver and iron, these cities symbolically relate to the three gunas or ‘qualities of nature’: sattva or purity (gold), rajas or activity (silver), and tamas or inertia (iron). Tripura Sundari is extremely beautiful, alluring and youthful like a ‘sixteen-year-old’ (Skt. sodashi), with full breasts, a narrow waist, three bewitching eyes, four arms, and a sweetly smiling face that reveals her upper teeth. She shines like the radiant light of the rising sun, with a complexion like cinnabar or a red hibiscus flower; and is clothed in lower garments of embroidered red and orange silk, with a blue upper bodice, and a long red scarf that billows around her shoulders and arms. She wears the Newar neck ornaments of an ornate golden choker, a lozenge-shaped tayo crowned by nine naga-serpents suspended on an ornate strap, a necklace of coins, and a square square silver medallion on a long chain. She also wears the gold ornaments of a five-jewel crown; earrings; bracelets, armlets and anklets; and a golden belt with hanging loops of pearls. With her lower right and left hands she holds three arrows and a bow, and with her two upper hands she holds a golden hook or goad and a rope noose or snare. These four hand attributes represent her activity of subjugation, and her ability to bewitch and control all classes of beings, and are similarly held by the main Vajrayana Buddhist subjugating goddess or dakini, Kurukulla. 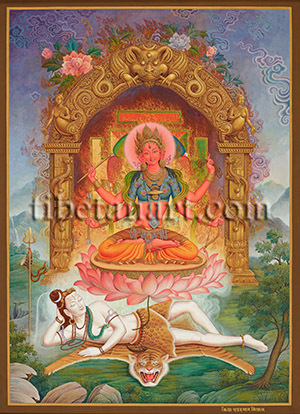 Tripura Sundari sits in vajra-posture on the golden seed-head or cushion of a pink lotus, the stem of which arises from the navel of white Shiva, who lies resting at ease upon a fierce and highly realistic tiger-skin mat. With his right hand Shiva supports his head, and the forehead of his peaceful three-eyed face is marked with the Shaivite tripundra of three vermilion lines. A crescent moon adorns his five-skull crown and topknot, from which cascades the white waters of the River Ganges. Shiva wears serpent and rudraksha bead ornaments, a tiger-skin loincloth, and his horn hangs from his belt strung with little golden bells. Embedded in the ground near Shiva’s head are the attributes of his trident and damaru or ‘pellet-drum’. An ethereal swirling mist arises from Shiva’s quiescent bodily form and merges with the aura of flames that surround Tripura Sundari, with the lotus-circle and square bhupura of her yantra with its four gateways appearing behind her halo. The golden arch or torana of her enlightenment throne arises from the pedestals of two lotus-topped treasure-vases with ornate pillars arising from them, around which entwine jewel-grasping dragons. On the capstone of each pillar stands a hybrid kinnari with a female upper body and the scaled feet and elaborately swirling tail of a makara or ‘water-monster’. Crowning the arched top of her torana is the huge horned head of Cheppu or kirtimukha, the ‘face of glory’, who feeds the tails of two writhing naga-serpents into his ferocious mouth with his two feather-sleeved hands. Flowers, leaves, flames and swirling clouds appear behind her torana, and she abides within a beautiful natural landscape.